KPAC has been importing polyethylene film through established distribution channels for over twenty five years. Kpac works through established distribution channels. Online stores and courier companies use our courier bags for the transport of goods and material via the postal or freight forwarding systems. A tamper proof closure provides document security check process. Unique coding system available to support track and trace of goodies. The workhorse for wholesale goods distribution. Liners provide dust protection, inhibit water loss in vegetables such as carrots, and ensure leafy greens are market crisp. Fish and shellfish have a carton liner for odour protection. A blue tint series is available. A core product range for KPAC available for next day delivery to your premises. Black or blue liners are used as light inhibitors for root vegetables or fish. Can be supplied on header blocks, perforated on a roll or loose. Recyclable material used. Food grade material is used in the manufacturing of these bags. Helpful hint: recycled as a suitcase liner. Used to divide and separate fish or bakery items. This provides protection while in transit. Used as interweave clothing protection. These sheets are available in either white or blue. Eliminates the need to individually bag items. Available in white or blue. Can be supplied on header blocks, perforated on a roll or loose. Helpful hint: recycled as a drawer divider or shelf liner. Punched holes provide drainage and air circulation for vegetable storage. Packaging vegetables provides a standard weight for distribution and sale. A core product range for KPAC with extensive ex-warehouse sizing available for next day delivery to your premises. Available in standard poly bags or customised high gloss printed bags. Additional features are barrier layers to modify water vapour transmission. Available as loose, header block or wicket formation. For bulk high-speed production available as reel stock on rolls for automated form fill machinery. Food grade material is used in the manufacturing of these bags. Helpful hint: useful for washing vegetables as water drains through holes. Standard clear plastic bag used widely in both the wholesale and retail sector. Available in various strengths (micron), these bags can store goods up to 15kg in weight. Ask our team for recommendations about which size will suit your requirements. While our ex-warehouse bags are loose, customised versions include gussetted or wicketted bags. Available perforated on a roll or on a header block and/or wicket. Printing is available (minimum order quantities apply). Punch hole retail hang option is available. Food grade material is used in the manufacturing of these bags. Helpful hint: place wet paint brushes in a poly bag while you have your cup of coffee. Largely used in the retail sector to bag goods being sold. Loaded onto dispensing holders the bags are sold as 1kg, 2kg and 5kg bags. The bags are designed for single use only. Recyclable. Can be used by households for the temporary storage of fresh fruit and vegetables in the fridge. This inhibits moisture loss. Helpful hint: keep one in your handbag as an on-the-go rubbish bag. Standard clear plastic bags with a seal track that is closed with manual pressure across the track. Available in a various strengths (micron) these bags can store goods up to 10kg in weight. Available printed and/or in customised sizes. While our standard unprinted bags are loose, customised versions are available on header blocks for easier pack and fill operations. Helpful hint: the bags are not designed to be tamper proof. 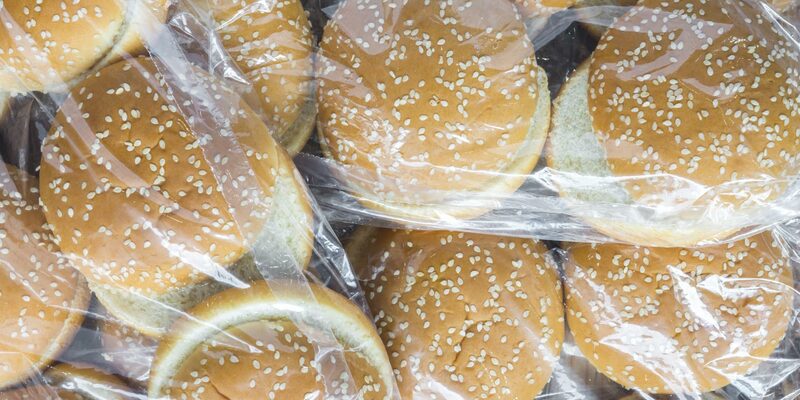 White tinted bags with an opening lip to assist with filling are widely used in the deli or butchery departments of retail operations such as supermarkets or specialised stores. For fish operations a blue tint series is available. The dispenser box ensures that the light weight bag is easy to remove and use. Printed and customised sizes are available as is specified strength (micron). Black tint ensures that the non-food grade bag is easily identifiable as a rubbish bag. Our co-extruded bags have a tensile strength that supports puncture resistance. Non-food grade and recycled material ensures that the bags are cost effective. Degradable options are a stock item. High clarity microperforated film allows hot bread to be bagged before cooling. For cold items non-perforated bags are available. Pie film for storage in heated pie machines is perforated. Bags are wicketted to support commercial bagging operations. Printed and customised sizes are available.